Prof. John Dudley, in collaborations with Prof. Morandotti’s team develop a new approach to study mechanical instabilties of ondulatory motion. Modulation instability is a fundamental process of nonlinear science, leading to the unstable breakup of a constant amplitude solution of a physical system. There has been particular interest in studying modulation instability in the cubic nonlinear Schrödinger equation, a generic model for a host of nonlinear systems including superfluids, fibre optics, plasmas and Bose–Einstein condensates. Modulation instability is also a significant area of study in the context of understanding the emergence of high amplitude events that satisfy rogue wave statistical criteria. Here, exploiting advances in ultrafast optical metrology, we perform real-time measurements in an optical fibre system of the unstable breakup of a continuous wave field, simultaneously characterizing emergent modulation instability breather pulses and their associated statistics. Temporal and spectral evolution of modulation instability. 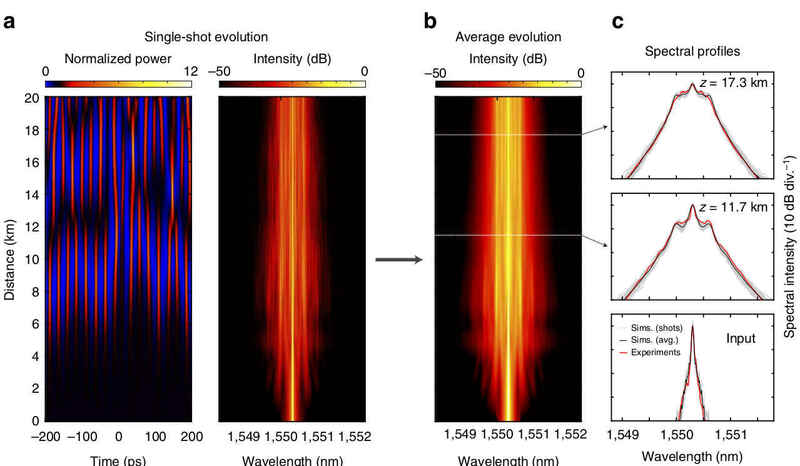 (a) Single-shot simulations showing temporal and spectral evolution of spontaneous MI. (b) Evolution of the average spectrum calculated from an ensemble of 50 simulations. (c) compares the simulated average spectrum (black) with that measured experimentally (red) at the ﬁbre input and after 11.7 and 17.3 km propagation as indicated. For each case in c, the superimposed grey curves also plot 50 individual realizations from the simulations to illustrate the degree of spectral ﬂuctuation. For the chaotic temporal pulse train, we plot instantaneous pulse power normalized to background P=hPi, whilst spectral plots are normalized to the input spectral intensity at 1550.3 nm. Our results allow quantitative comparison between experiment, modelling and theory, and are expected to open new perspectives on studies of instability dynamics in physics.